“Pemba seems to enjoy exploring the ocean, in wide circles, around sea mounts, as we have seen before. Over the last month she has traveled 700 kilometres in a wide circle just South of Namibia. 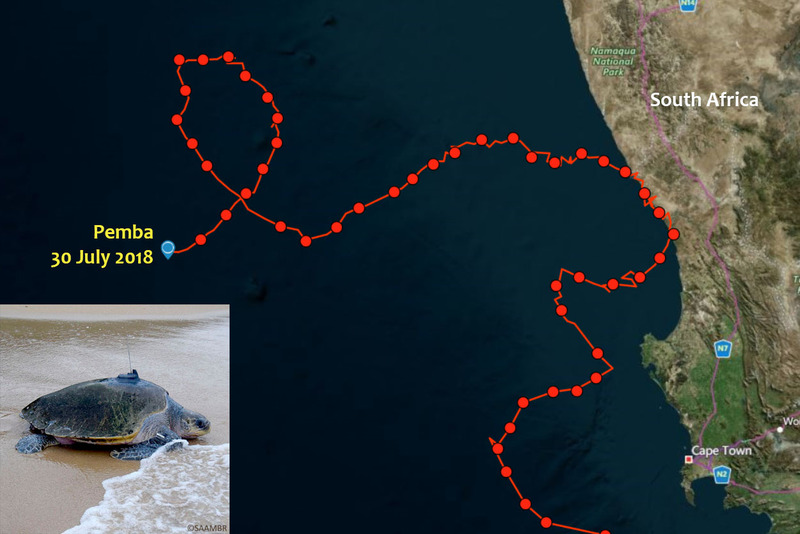 She came so close to getting her passport stamped, but it seems she decided to rather feed offshore than head up the Namibian coast. 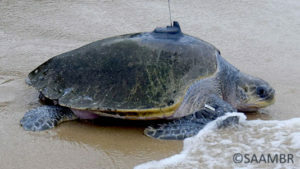 She has been in the ocean for 141 days now and has slowed down her pace to 23.5 kilometres per day. Her average swimming speed over her entire journey is about 41km/day. Pemba is still in 17°C water, at the lower end of her preferred range and she is swimming with a very slight Northerly current but against a strong Southerly wind. The straight line distance between Yoshi and Pemba is currently 1300 kilometres, and their release sites were 1800 kilometres apart. 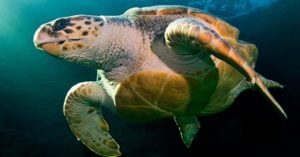 On 16 December 2017 the Two Oceans Aquarium released Yoshi the loggerhead turtle back into the ocean. ” Yoshi had a great time in the warmer waters off Angola, and we were wondering whether she was going to continue her journey up to the Cape Verde Islands, or even cross the Atlantic and head towards Florida, but she had different plans all along. On the 18th of June she made a u-turn (which is legal in the ocean) and headed closer towards shore. As per previous observations, we believe she was feeding in the shallower and warmer areas along the coast. 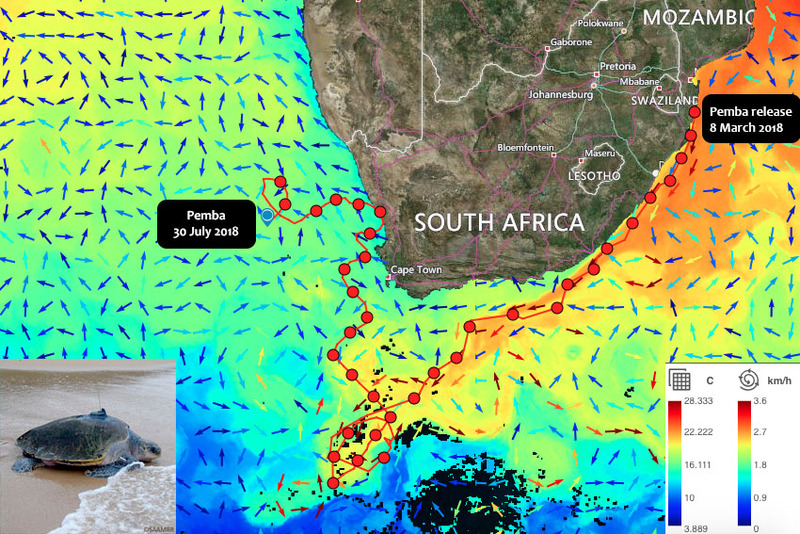 Since then she just kept going and has traveled 1500 km South right back to Namibian waters. She is currently about 200 km offshore, West of her position recorded on the 29th of March. She is in line with Skeleton Coast Park actually. 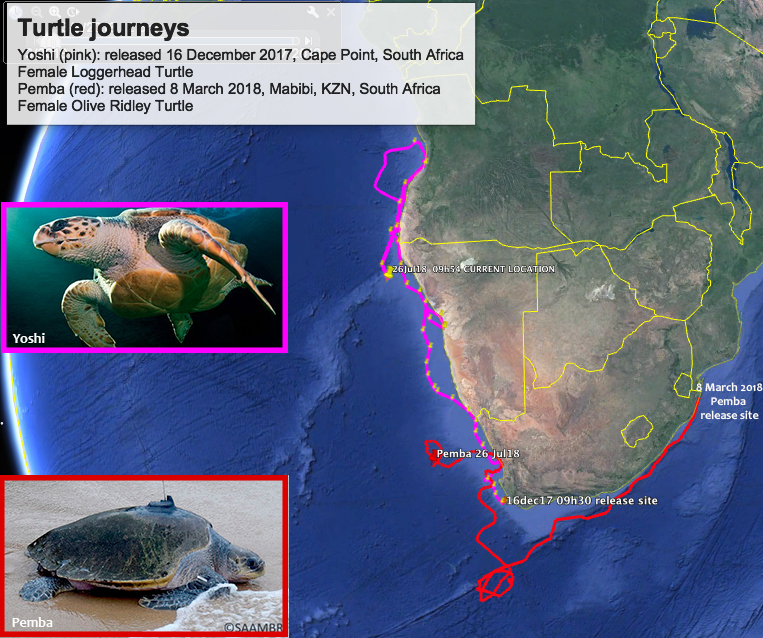 She has picked up her swimming pace slightly, with an average of 38km/day currently, and 27km/day for the entire journey since release. The sea temperature is quite a bit colder than what she experienced in Angola, sitting at about 17°C. She is not using any current at the moment, but swimming against a rather strong South-Easterly wind. Is she heading back to Cape Town – or planning to go up the East Coast of Africa as we originally assumed she would do. 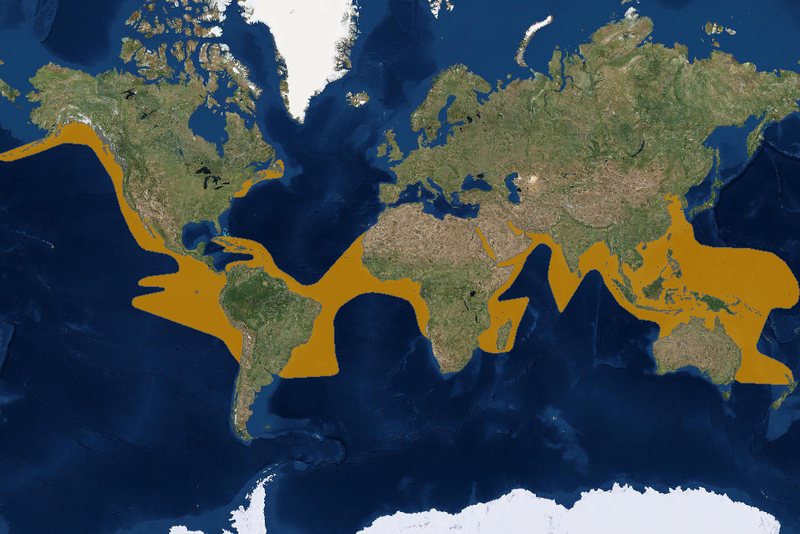 She has covered more than 6000 kilometres over the 223 days back in the ocean.